To celebrate the imminent release of The Legion of Flame I’m holding a mailing list signed books giveaway. Existing subscribers to my mailing list and anyone who subscribes between now and midnight GMT June 25th are automatically entered. All books will be signed, lined and dated (with a personalised dedication if requested). The winners will be chosen and notified on 26th June. 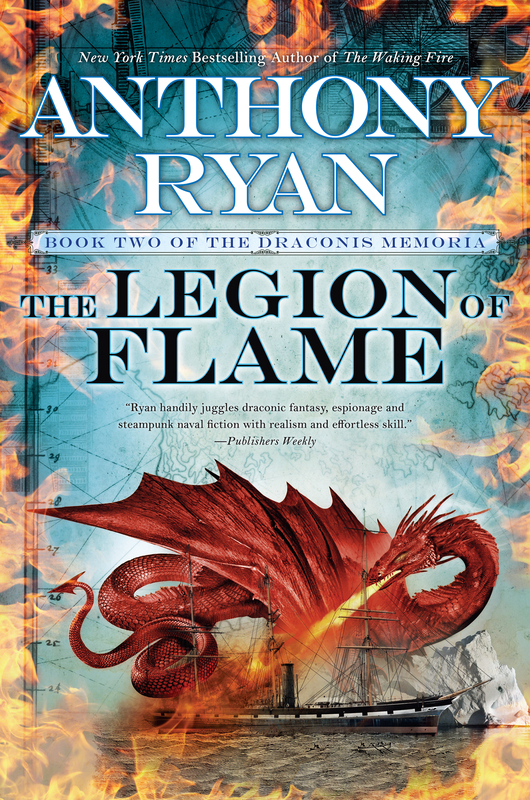 Note for readers in the UK, Ireland, Australia, New Zealand and South Africa – the release dates for the Orbit edition of The Legion of Flame have been brought forward. The ebook and audio versions will come out on 27th June and the hardcover and ANZ trade paperback editions on the 29th, so anyone who pre-ordered will receive their books earlier than expected. Also, a reminder for anyone who missed it that my Raven’s Shadow short story A Duel of Evils is now available as a standalone ebook. Congratulations to the three winners of the Unfettered II giveaway contest. The winners have been notified and will soon receive their free ebooks from Grim Oak Press. Commiserations to those who didn’t win but watch out for a signed Waking Fire hardcover giveaway closer to Christmas. Unfettered II has also been selected as one of Amazon.com’s top five fantasy books of December 2016. Check out the full list at Omnivoracious – The Amazon Book Review. In other news, the new Raven’s Shadow novella is nearing publication – check back for full details in the near future. For now I’ll just reveal the title: The Lady of Crows. Sign up for the mailing list to be sure you don’t miss the announcement. Thanks to fellow fantasist Jeff Wheeler – author of The Legends of Muirwood and the Kingsfountain series – for inviting me to contribute to the relaunched Deep Magic Magazine. Anyone curious about how I edit my work should check out my article ‘How I Edit a Novel’, as well as a lot of great content including a story by Jeff himself and an interview with Brandon Sanderson. The June 2016 issue will be available in ebook format on the 14th but can be pre-ordered on Amazon at the low low price of $2.99. The magazine is also open to submissions so any aspiring writers should check out the website here. You can also drop by the Deep Magic Facebook page. Very pleased to announce that my story ‘The Hall of the Diamond Queen’ will now appear in the upcoming Unbound anthology from Grim Oak Press. Keen eyed readers will recall that this story was originally slated for inclusion in the sadly defunct Unveiled anthology and I’m grateful to Shawn Speakman at Grim Oak for finding a home for it. When I started all this if someone had told me I’d one day appear in a line-up like that I would’ve though they were very nice but also very deluded. An awful lot can happen in three years. A release date for Unbound is yet to be set but it’s expected to appear in early summer 2015. Grim Oak Press will be taking pre-orders on their website from 1st March. In addition to the ebook and trade hardcover editions, there will also be two special editions; a hardcover Advance Review Copy limited to 250 copies and a signed & numbered leather-bound edition limited to 500 copies. Anyone who orders a trade hardcover or ARC edition in March will also receive a free copy of the ebook. I’m also told the above cover is just a placeholder and the final version will feature an all new illustration by the excellent Todd Lockwood.